The Michelin Guide has been awarding stars to select restaurants for excellence since 1926 and today, they still serve as a major benchmark for exceptional quality. When a star is awarded, a restaurant is recognized as being very good in its category while a second stands for excellent cooking that's worth a detour. Very few places manage to gain three stars and that signifies exceptional cuisine worth a special journey. Japan can boast about having some of the world's most exquisite culinary experiences, given that it has the most three-star establishments of any country. According to German blog Trois Etoilles, Japan has 28, ahead of France's 27 (which also includes one restaurant in Monaco). The United States comes third with 14 altogether. Five can be found in New York, four are in San Francisco, two are are in Chicago and the others are in Los Gatos, St. Helena and Yountville. Japan's position at the top of the three-star league has proven controversial in the past with some western chefs finding the situation hard to stomach. 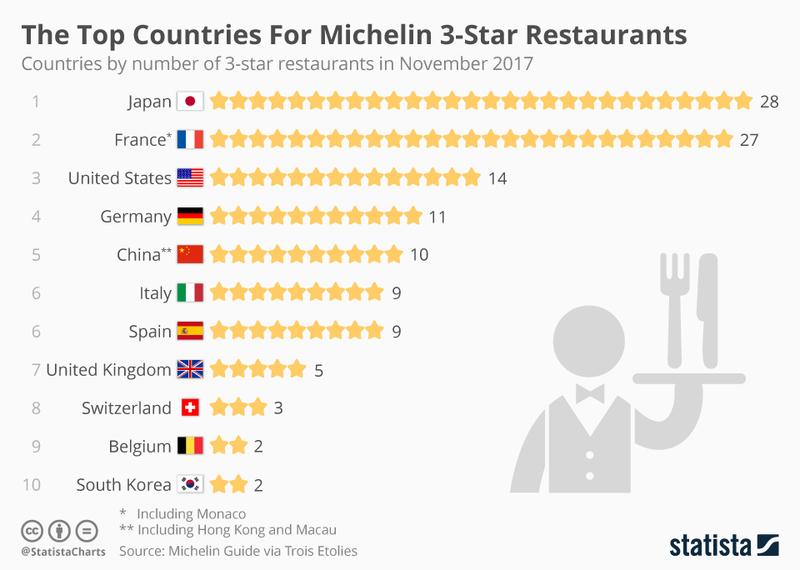 Some questioned whether Michelin's alleged leniency in awarding stars was a tactic to establish itself better in the Japanese market. However, it can also be argued that the nation's cuisine deserves to be held in high esteem regardless, something which can be seen by the fact that New York has the most Michelin starred Japanese restaurants outside Japan.